Bibimbop literally means mixed rice or mixed meal in Korean. It's a popular meal consisting of a bowl of steamed white rice topped with vegetables, beef, a whole egg, and kochujang (red chili pepper paste). 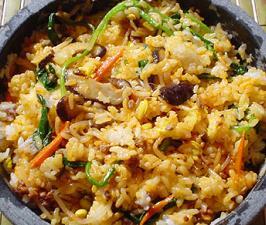 Kochujang is usually served separately to control its spiciness of this rice dish. A variation of this dish, dolsot bibimbop (dolsot meaning stone pot) is served in a heated stone bowl, in which a raw egg is cooked against the sides of the bowl. Before the rice is placed in the bowl, the bottom of the bowl is coated with sesame oil; consequently, the portion of the rice touching the bowl becomes golden brown and crispy. Vegetables commonly used in bibimbop include julienne cucumber, zucchini, carrot, white radish, mushrooms, bellflower root, and laver. It may also contain spinach, soybean sprouts, and bracken fern stems. Tofu, either plain or sautéed, may also be included in the dish as well. Within both types of bibimbops, all ingredients are typically stirred together thoroughly before eating. Wash 3 cups of rice, soak for 30 minutes and drain. Put the rice in a thick cooker and add 1 cup of water, then bring them to a boil. After 10-15 minutes boiling, reduce the heat and simmer with the lid on for 5 minutes. Do not lift the lid while cooking. Season beef and stir-fry lightly until cooked. Cut cucumbers, carrots and shitake mushrooms into match stick size and shred bellflower roots (doraji) and lettuce leaf. Squeeze out excess water and sprinkle them with salt (not including lettuce leaf). Add 1 tsp of sesame oil to hot frying pan and stir-fry the cucumber quickly so the color stays vivid. Spread them on a big plate to cool. Add more sesame oil, then stir-fry bellflower roots, carrots, and mushrooms consecutively. Place cooked rice in a deep dish and add the prepared ingredients on top of the rice (*for hot stone dolsot bibimbop, heat the stone pot until hot enough to burn the fingers and coat 2 tsp of sesame oil. Place the rice sizzling right into the hot stone pot). Fry an egg sunny-side-up in a frying pan and place it on top of the dish (*for hot stone dolsot bibimbop, place the raw egg on the side of the hot pot so it can slightly cook). To make seasoned kochujang paste, combine kochujang, sugar, sesame seeds and sesame oil. Mix all ingredients well. Add seasoned kochujang to taste and mix it thoroughly with rice and vegetables before eating.